The closure of Honda in Swindon would have "disastrous implications" for the Kasai automotive plant in Merthyr Tydfil, a source has told the BBC. Honda is expected to announce the closure of its Swindon car plant in 2022, with the loss of about 3,500 jobs. Kasai employs 200 people in its Welsh factory. According to its website, Kasai supplies interior automotive components for Nissan and Honda. The source at the plant said it was awaiting official confirmation from Honda and had not been told anything. 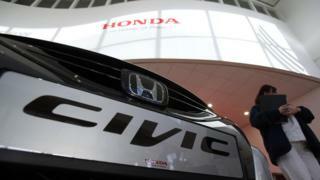 Tim Williams, chief executive of the Welsh Automotive Forum said, if confirmed, the news would have a "devastating impact" on Honda workers and the supply chain companies. "We are in contact with our suppliers in Wales and working with the Welsh Government to understand the impact of this announcement," he said. Local Swindon MP Justin Tomlinson said he had spoken to Honda, which confirmed it was consulting with "all staff". This comes at a particularly difficult time for the Welsh car industry with almost 400 voluntary redundancies expected at Ford in Bridgend, and the closure of Schaeffler in Llanelli, resulting in 220 job losses. In contrast, Toyota has said it will continue production at its engine plant in Deeside.